A BRADWELL carp for Mitchell Ridgway at only his second attempt. And he didn't have to stay out all night, catching the fish during an evening session and bagging a nice bream to go with it. Don Warner had some nice carp at Furzton as did Kane Thompson on Tear Drops. 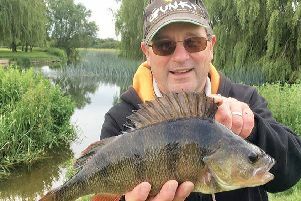 WHILE his wife ran the 'Race for Life' Phil Mapp chilled out with Willen's bream, having fish to 8lb in a short session – and unlike the runners didn't even break sweat. THE Lodge close season hasn't stopped some pursuing the water's carp. Bailiff Ian Pledger and pals Louis Smith and Martin Kingston went into the stream below the outfall to rescue – and return to the lake – fish to 8lb washed out by recent floods. Great job lads. MKAA youth coach Nuala Gray and husband John – both Level 2 coaches – have just been on an intensive coaching course organised by Canal River Trust's fisheries team. MKAA individual league second round, Bradwell Lake: Paul Hamilton 25-2 (bream), Kevin Osborne 2-3, Ian Smith 0-8. 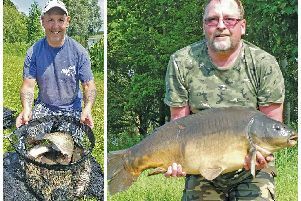 HNW AC, Alders: Ricky Knott 174-4, Paul Holmes 120lb, Dennis Wright 66-1. OSPREY, Rolfes (Essex): Neil Riddy 136lb, Pete Archer 124lb, Adam Griffiths 108lb. MK Vets, Alders: Martin Cunniffe 82-2, Steve Chilton 81-14, Paul Chapman 77-4. BLACK Horse open: Phil Bardell 68-2 (bream), Gordon West 37-9. TOWCESTER Vets, Flecknoe: John Balhatchett 52-12, Dave Prodger 46-8, Ashley Jackson 32-2. NENE/ Towcester, Heyford canal: Paul Minney 10-2, Brian Ayliff 8-6, Bob Gill 7-12. CALVERT, Claydon Lake: Austin Maddock 6-11 (inc 5-12 tench), Barry Witteridge 3-11, Dave Lewis 3-5. LINFORD, canal, Wharf: Roy Hefferon 5-9, Mick Hefferon 5-3, Ron Dorrill 2-12. FIXTURES: Saturday – river season opens along with Lodge and Caldecotte South; Sunday, Newport Abbey Pits mini-open 07795 068428; June 23 MK individual league, Tear Drops, 01234 713144.